Wow, what an experience! 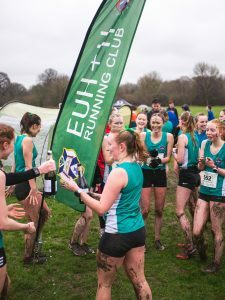 BUCS 2018 was an exciting, mud-splattering adventure with all the team demonstrating the inclusive (key), supportive spirit of the Haries with strong performances all round and a shot of fun and celebration to finish the night. It was moving to see the depth of talent amongst the team-green vests dotted throughout a stacked women’s race, Haries pushing up towards the front in the men’s A race and distributed in an eye canny (?) stream in the B race. There were screams of excitement as Edinburgh Hares as well as hounds, left right and centre fought off the other universities; battling to prove Edinburgh’s supremacy. Yep, so the women’s race was pretty good. The matching green ribbons in the hair of the Haries indicating real team spirit. I suggested that all the men shave their legs prior to the race for a similar showing of unity but nobody seemed keen. 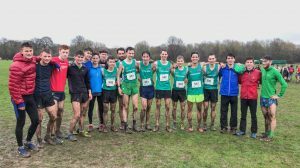 England cross country champs the previous weekend; Mhairi had big aspirations for BUCS. She ran strongly, just dropping off the front pack and finishing as first Scot in 7th. The 6.5k women’s course was slightly longer than Steph’s last outing over the 1k relay at Holyrood but she showed fine form to take 12th. Barring injury and illness, Mhairi and Steph will be an imperious duo at the National Cross in a couple of weeks’ time. The big pre-BUCS debate on the six hour train journey to Uxbridge was who was going to be the third counter for the women, Naomi Lang or Anna Macfadyen? Both running their first BUCS, they took their (pool) cue from their elders Maclennan and Pennycook. They had a great battle with Anna edging closer to Naomi throughout the race. In the end it came down to just three seconds, with Naomi proving the most powerful up the long drag to the finish. A Further fresher in the top 50 was Katie Lowery with Laura Stark only 8 seconds back. Rebecca Johnson and Catriona Graves were well within the top 100, proving the strength in depth of our women’s team. 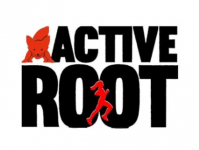 115th at last year’s race in Sheffield, Amy Frankland sneaked closer to a top 100 placing with 105th. Franko is on a definite upward trajectory and will almost certainly be in peak shape for Falkirk. 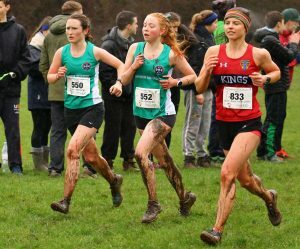 BUCS debutants, Rhiannon Kirk and Rona Tyler performed admirably and will also be ones to watch in the U20 women’s race at Falkirk. 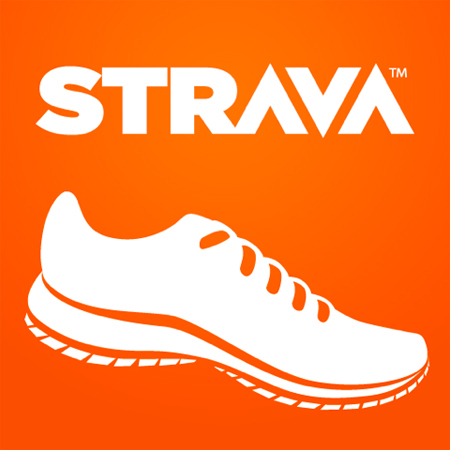 Helen Jones improved on her race at Broxburn with a strong race, finishing 10 seconds behind Rona. Louise Mccullagh looked like she was enjoying the river jump far too much on lap one whereas Katie Hall’s preferred course feature had to be the only notable hill on an otherwise flat course. Packing well were the trio of Eliza Cottington, Jennie Glass and Iona Evans. The latter being lucky enough to share a hotel room with Captain Ben for the weekend. All three finished within 5 seconds of each other with Jennie just dipping Iona at the line. This was only Lydia Blythe’s second appearance over cross country this year and her exponential return to form has been impressive to witness. Rosie Wright also looked comfortable bouncing through the muddy fields of Hillingdon. Katie Cutforth’s first BUCS experience was filled with fun. Her race might have gone a bit better if she hadn’t paused to pose for photos at every opportunity. Carla Willars had an equally enjoyable run. The bright lights of Uxbridge are fairly close to home for Carla so we had to pleasure of her parents visiting the Haries tent too. The girls from Kilmarnock, Christine Irvine and Eilidh Macquarrie were close for most of the race but Christine’s experience saw her stretch the eventual gap to 35 seconds. 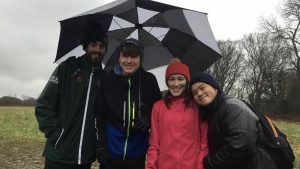 Eilidh enjoyed a BUCS birthday and was spurred around the course by the dulcit tones of myself and Ben Murphy, singing the happy birthday song. 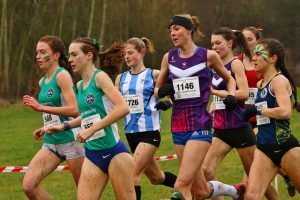 After leaving her spikes on a Scotrail service and being forced to miss out on Broxburn, Rachel Stewart made her return to racing in this first weekend of February. She showed poise negotiating the water jump and it was pleasing to see her dish out a few elbows during her race. Linette Knudsen was less sure about the water jump, hesitating for a few minutes before diving in. She made up for this time loss with an inspired sprint finish. The men’s A race was our most successful in recent years as Alex Leutchford usefully pointed out. The team finishing 6th out of 54 teams and predictably first out of the Scottish Universities. Euan Gilham was our first counter in 33rd. A pleasurable weekend on the whole for Euan as he got to share a bed with Callum Symmons. They topped and tailed. Jack Leitch was giddy with excitement after his race. He was 35th and a mere 4 seconds behind Gigamesh. 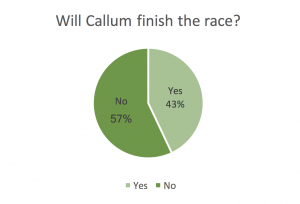 Jacob Adkin put a restless night behind him to run a fine race, once again taking the scalp of Callum Symmons. The men’s B race features the leftover runners from British Universtities. The dregs at the bottom of your pre-race coffee. The Haries B team had some high-quality dregs and managed to finish 8th out of 116 teams. Ewan Davidson enjoying a stellar season was resigned to the B race after a blip at Broxburn. An ‘epic sprint duel’ against myself was Ewan’s BUCS highlight. Stride for stride; searching for cracks in each other’s armour; arms flailing; gasping for breath, it was methat made it to the portaloo first. Eddie Narbett was first of the orienteering bunch home; only a handful of seconds behind portaloo pairing, Ewan Davidson and myself. Eddie raced incredibly strongly on his Haries debut to finish 31st. The 8k race was a tad short for burgeoning ultra-runner Tim Morgan but he had an excellent race taking some big scalps. Andrew Johnstone was one of those big scalps. He was very active at the beginning of the race, mixing in with the big boys at the front. Andrew described the race as a grudge match between the Haries and orienteers. Ali Masson and Gregor Malcolm were less than satisfied with their respective races. At least Gregor looked the part with his funky shorts and the go faster haircut courtesy of Ali himself. Tam Wilson had a commendable run in a rare cross country appearance. He was followed in by Ruaridh Mon Williams who sacrificed his characteristic ‘banter start’ for a more sensible and successful race. Jack Eykelbosch ran a very steady race, cannily making his way through the field on the second lap in his first race back from injury since April last year. Dan Smith is also recently returned from a debilitating injury. He had a good run but took even better pictures of the event. Ben Murphy can’t have had much energy left after negotiating the London Underground and leading his troops to Uxbridge Travel Lodge the night before. He used his remaining energy to give a rousing battle cry on the startline which got us all fired up. Ben had a solid run and afterwards forked out £900 for our meal in the evening. Never was he more deserving of those captain’s shorts! Darko Perovic made a famous comeback all the way from Sweden for this race and once again made the mistake of only bringing Hokas. Fortunately Come Back Cal was on hand to lend him his spikes. Thanks for coming Darko! Nicholas Rooms was another making his cross-country debut for the Haries at BUCS. No doubt given tips by roommate, Ruaridh Mon Williams, Nicholas delivered a substantial sprint-finish at the end of his race. Not racing but watching from the water-jump, Mook made a welcome return to Haries action, providing some encouraging and motivational words to all the runners from all universities. What a hero. Speaking of heroes, Thomas Otton recently tore the soleus muscle in both calves so was out of the running for an inevitable A team slot. Nevertheless, he still made the trip to Uxbridge-on his 20th birthday-to selflessly stand in the rain and play a supporting role. As Ruaridh made clear in his introduction and as the results showed, we make a pretty fantastic team. Thanks for the fun weekend!